Multiple Award winning Ghanaian Nurse and Social Entrepreneur, Sara Nana Yeboah has being awarded Ghana’s Most Outstanding Associate Clinician (Ward) at the 2017 HELEH Africa People’s Choice Practitioners Honours held in Kumasi. The award ceremony organised by Media Men Ghana in Partnership with the Medical and Dental Council and patronised by His Royal Majesty Otomfuo Osei Tutu II, Ruler of the Ashanti Kingdom was meant to celebrate various individuals and organisations whose contributions to the health sector of Ghana have been enormous and duly deserved to be honoured for their selfless contributions. Mrs Sara who has been celebrated for her philanthropic works across Africa through her NGO, the Sangy Foundation raised the bar when the organisers threw the spotlight on her selfless role in the nursing profession at the Greater Accra Regional Hospital, Ridge Hospital as the Most Outstanding Associate Ward Clinician in the whole of Ghana. The Awards package which included a 32-Carat Gold Medal, Certificate of Honour and a Kente Slash were presented to her at the event hosted at the Kumasi Golden Tulip Hotel in the presence of various dignitaries and stakeholders in the Ghanaian health sector. 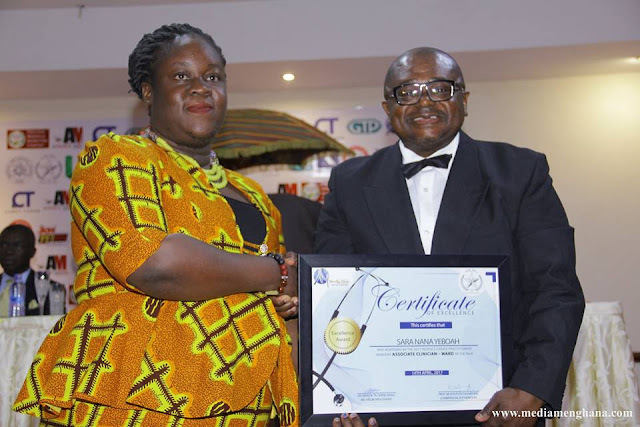 The awards also recognised Honourable Professor Kwabena Frimpong Boateng as the recipient of the highest honours among its categories, the HELEH Africa PCP Legend of the Year, for his continuous significant contribution towards the overwhelming enhancement of the medical field in Ghana and Africa. Other Notable awardees include Okyeame Kwame, Ernest chemist, UTV, Vodafone Ghana, Holy Trinity Spa & hospital, Benson Owusu, Dr Ellen Boakye, Bisa App, Dr Richard Selormey etc. Some distinguished awards received by Mrs Sara Nana Yeboah include: 2014 Africa Youth Awards Female Personality of the Year, Social Entrepreneur of the year at the annual Ovation Magazine Carols Night and Awards, Distinguished Service to Humanity Award (Public Health) by The Sun Weekend Newspaper, African Development Recognition Award for Philanthropy by Pleasures Magazine and other accolades from Reconnect Africa and Camfed Ghana.